The all-new Headlight Restoration Kit from Osram Sylvania is great for restoring headlight lenses with out any tools. The results are like-new performance in light output. The Headlight Restoration Kit from Sylvania restores clarity and removes the hazy yellow appearance on headlight lenses, plus it provides a UV Block Clear Coat, which protects headlights from UV rays. After use, you’ll see a significant improvement and be able to see up to three times more light shine on the road. Other product benefits are up to 70 percent glare reduction and long-lasting results compared to competitive products. It can be used on brake lights, boats and motorcycle headlights. Everything is provided in the kit, including the surface activator, clarifying compound and UV block clear coat. 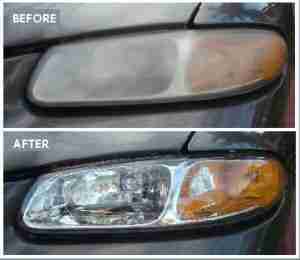 If you want to see how easy it is repair your headlights, check out this video – it is so simple that any one can do this without any tools. SYLVANIA Headlight Restoration Kit – Demonstration of step-by-step process in English. A simple do it yourself guide to how to restore a car’s headlight bulb. I was able to find this kit in local stores and online for around $20.